With the continued success of the Mosconi Cup and the recent addition of the U.S. Open 9-Ball Championship, Matchroom is poised to take its events � and the sport � to new heights. Matchroom Sport President Barry Hearn is in the Billiard Congress of America Hall of Fame with good reason. For 25 years, Matchroom has produced nearly 100 world-class events, providing the game’s players and fans with nearly $10 million in prize money and more than 2,000 hours of television programming. Matchroom’s World Pool Masters and Mosconi Cup both turn 25 in 2018. The World Cup of Pool is close behind. It would be hard to blame Hearn and Matchroom if they simply decided to coast along, sticking to their current blueprint. After all, they’ve already set a bar that few, if any, promoters in the sport even get within sniffing distance of. But that’s not Hearn’s style. While most tournaments are scaling back and/or disappearing altogether, the dynamic promoter and his passionate staff appear to be more bullish and excited about the game than ever. To wit, Matchroom, which has not produced a multi-table, large format pool tournament since the World Pool Championship in 2006, acquired the U.S. Open 9-Ball Championships this past spring and promptly guaranteed live television and a $300,000 prize purse for 2019. The 2018 Mosconi Cup, the sport’s most intense and raucous event, will welcome an astonishing 2,500 paying fans to London’s Alexandre Palace in December and promises to up the ante on circus atmosphere. 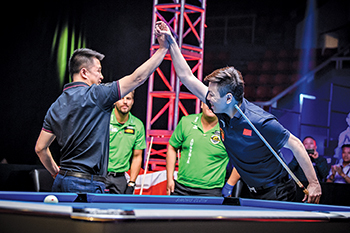 And now comes news that both the World Cup of Pool and World Pool Masters will be retooled in the coming year, promising new twists and more money. What’s spurring the renewed excitement and commitment from the British sports promoters? 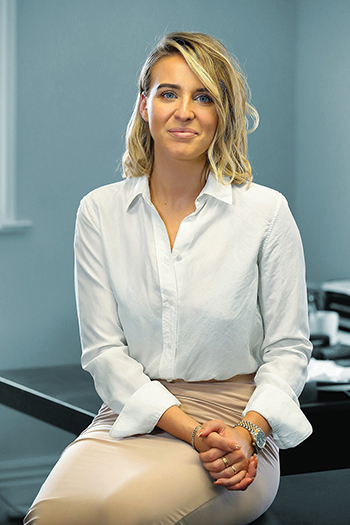 Billiards Digest publisher Mike Panozzo posed that and other questions to Matchroom Multi Sport COO Emily Frazer. Frazer oversees the Matchroom Sport division that, in addition to pool, produces events in tenpin bowling, basketball, table tennis, snooker, fishing, netball and gymnastics. (Matchroom’s biggest properties — World Snooker, Matchroom Boxing and Professional Darts Corporation — operate separately under the Matchroom Sport umbrella.) With four annual events, pool is the biggest piece of the Multi Sport group, and Frazer, in her eighth year at the company, insists the group’s interest in elevating the sport has never been higher. There seem to be a lot of big announcements this year with Matchroom pool properties. Something new in the water at Matchroom headquarters? The biggest things, of course, have been the acquisition of the U.S Open 9-Ball Championships and the continued growth of the Mosconi Cup. Those two things have ignited a spark. We’re more excited than ever about the sport and we see that there is room for pool to grow. 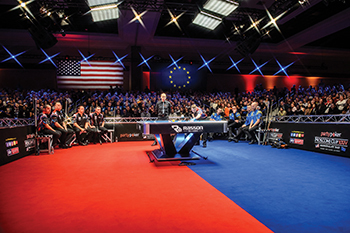 The Mosconi Cup, of course, sets viewership and attendance records every year, so we’re always excited about making that event bigger and better. But the addition of the U.S. Open 9-Ball Championship has generated a whole new level of excitement. The U.S. Open brings us back to doing a multi-table, big field tournament for the first time in more than a decade. It is an entirely different challenge. I visited the Cue Sports International U.S. Open 8-Ball and U.S. Open 10-Ball Championships in Las Vegas and was astonished. I saw things that I never would have thought about. A lot goes into an event like this, so our team has been having logistics meetings. We realize there is so much going on all at once, and that’s fantastic. That is what gets us excited. We’ve taken a close look at the U.S. Open 9-Ball over the past 42 years, and have looked at what has and hasn’t worked. We’ve shared ideas with Brady and Shannon Behrman (son and daughter of late U.S. Open founder Barry Behrman). We’ll maintain the tradition their father started, but we will also apply our Matchroom style to the event. We want to see how we can improve it and put our own unique stamp on it. What does a multi-layered event like the U.S. Open allow you to do that a smaller, more structured invitational event doesn’t? We can look at the bigger picture. Now, when you walk into that huge convention center at Mandalay Bay, there is so much we can do with the space to make the experience great for the spectators and our sponsors. It’s a different atmosphere for the fans and a different ticket, where they can move around and watch any number of their favorite players. Our plan at this point is to have two tables set up as live stream tables with featured matches each round. The staging will be completely different than what we’re used to. The size of the field (256 players) will allow us to bring that buzz feeling into the convention center that we think will be on another level. We’ll have the live streams, but we’ll also have roaming cameras all around the convention center, and we’ll create preview shows for television that will show how we get to the last 16. There will be features and interviews. It will look a little like the World Series of Poker. And the idea will be to make it so accessible to the fans and to the people watching at home that everyone who is a fan of pool will know that the U.S. Open is happening. Sky’s live coverage will begin with the final 16, which will be in a separate arena next door. At that point, the event will look more like Mosconi and World Pool Masters. Sky will air each final 16 match over three days live in the UK: three sessions on the first two days and two on the final day. Does adding the U.S. Open 9-Ball Championship, the longest running major pool tournament in the U.S., help Matchroom in attracting a U.S. broadcaster? That’s something that we continue to work on. We are doing a gymnastics event with (four-time Olympic Gold Medalist) Simone Biles and bringing bowling’s Weber Cup to the U.S., so with the addition of the U.S. Open, we are trying to become a serious content provider to U.S. broadcasters. Creating annual events in the U.S. should help us get a foothold and make an impact in the U.S. market. It’s an exciting time. Frazer insists Matchroom's passion for pool will continue to elevate the sport. How will you tap into the U.S. fan base, and what can they expect at the U.S. Open? Realistically, we don’t expect to get Mosconi Cup-type numbers right out of the gate. But the continued growth of the Mosconi when we stage it in the U.S. is a good indicator that we are penetrating that community. Our success in the U.S. with the Mosconi should help us with the U.S. Open. We are not an unknown here, but we will be realistic with our expectations. It will be more important to have a packed smaller arena than to have a half-filled huge arena. We want to sell it out and get a good atmosphere in the arena so that people watching will want to be part of it live next time. Everyone knows that Matchroom doesn’t do anything halfway. So even though this is our first event here, we will go all out because it will impact the future of the event. And because of the size of the event and size of the field, the U.S. Open affords us a great opportunity to bring in new fans that will then learn more about our other events. It’s a great opportunity to grow the sport, which was what we want to do. We have such a passion for pool. The World Cup of Pool will undergo changes in 2019. 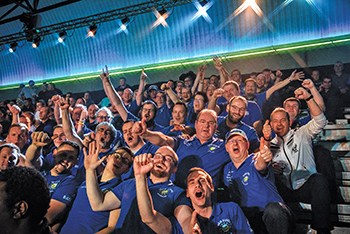 How will the World Pool Masters and World Cup of Pool benefit from this new energy? As we’ve discussed ways to make the U.S. Open more of an experience, we’re looking at the other events the same way. What can we do to enhance the World Pool Masters and the World Cup of Pool? How can we make them more enjoyable for the players, for the fans and for the viewers? For starters, we’re going to increase the size of the World Pool Masters from 16 to 24. We will also increase the prize fund to $100,000. We will seed the top eight players and add them into the single-elimination after the first round of eight matches. How does the addition of eight players translate to more interest and more viewers? It starts off by reaching into the U.S. and perhaps adding a second U.S. player. And what’s not to say we can’t automatically give a spot to the Mosconi Cup MVP, which again could impact the U.S. market if the U.S. wins the Mosconi. And couldn’t we bring a female player or two into the mix? We’d love to increase the visibility of women’s sports. We will engage the fans by making one of the additional spots a “Fan’s Pick” spot. We will likely develop a short list of players, and the fans will select which one gets the spot. Social media has become such an important part of the equation. We can take that risk with an expanded field. So, there are a lot of ways to add excitement and interest to the event. Additionally, eight more players equal four more matches. Instead of 20 hours of television, this takes it to 27 hours. More hours makes more stars, more engagement. And increasing the number of countries represented can bring new broadcast partners into the equation. Aside from having the U.S. win, how can you improve on the Mosconi Cup? Engagement with the live audience is something we’re going to work on for Mosconi Cup, and hopefully we can take that to the other tournaments. This is really important to us. We want the time ticket holders spend at the tournament to be so positive that they can’t wait to come back again. And when TV viewers see all the excitement and see the fans so involved in the event, they will want to get a ticket next time as well. We can only achieve that by making it a fantastic atmosphere to be at. We’re back at Alexandre Palace in London this year, but it will look completely different. The arena will be in the round, with seating for 2,500. And we’re well over halfway sold. We will be adding large projector screens to make it easy for everyone in the arena to see the action. It will be more of a professional darts feel. Spectators will feel like they’re right on top of the table. We’re building a new set. There will be more engagement with music. We’re going to have a dedicated team for audience interaction. There will always be something going on. No one in the arena should ever be bored. I’d love to have people turn up in fancy dress. We might have a stand there so people can buy fancy dress. We want to make it a happening. The more people want to be part of the Mosconi Cup, the better chance we have of getting them excited about our other events. Much of Matchroom's focus will be on fan engagement and bringing their other events up to the level of the popular and raucous Mosconi Cup. To an extent, there is some pressure on Matchroom with the U.S. Open and Mosconi Cup because players and fans have come to expect so much from you. There is, and it makes me a little nervous for these next events. But we love that challenge. The audience is why we’re here. If they don’t come and/or watch, we don’t have an event. We’re okay taking financial risks because we’re confident that the return will be there going forward. You have to be proactive and take risks. And if you follow your instincts, most of the time it will work out. The time is right to jump to the next level. Each of our events is unique. Our goal is still to make the sport as big as it should be and be the leading promoters in the sport.